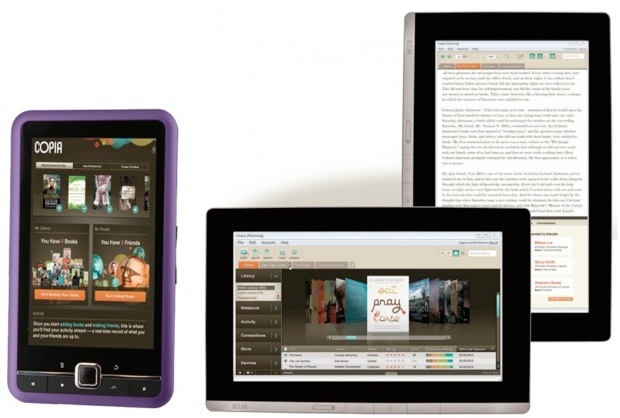 Amazon and Apple have shaken up the e-reader and tablet PC markets. Meanwhile newcomer Copia is intent on playing in both of these games, and Sony’s determined, in its own way, not to play at all. Amazon is credited with basically inventing the modern e-reader phenomenon, just as Apple is reinventing the entire slate PC genre–but Copia, who we wrote about yesterday with their color-screened $99 Kindle challenger, really plans on entering both markets with a huge splash. CrunchGear has been speaking to the new pretender, and discovered that in addition to the super-cheap Wave5 e-reader there’s a bunch of other slate-format devices en route. First up is the actual challenger to the Kindle, the Copia Tidal, which has a 6-inch e-ink screen, physical keyboard, SD card slot, optional Wi-Fi and MP3 player. It’s also priced at Kindle-levels–$150, though we wonder if Copia will adjust this pricing in the light of the new Wi-Fi-only graphite Kindle. There’s also the Wave7, a bigger version of the Wave5 with a 7-inch LCD screen, capacitive touch tech and a shockingly low $130 price. This is going to be a serious threat to the Kindle, because although it can’t compete on the display tech front (where some people still prefer the paper-esque appearance of the e-ink screen) it can do so much more. Meanwhile the Ocean Color is an even more exciting machine, a 10.1-inch capacitive touchscreen slate PC with 16:9 ratio, 4GB of onboard storage, stereo speakers and a “tilt sensor.” At first blush this sounds like a serious iPad competitor, but we doubt it’ll have quite the same “oomph” under the hood as Apple’s A4 ARM chip. On the other hand, its $300 price may certainly tempt some folks who want to buy into the slate PC market, in a similar way as netbooks seduced many folks into buying their first notebook-format PC. Is this another “race to the bottom,” though? Will the Ocean Color actually disappoint users in the end with a lackluster performance that doesn’t live up to their expectations? It’s almost impossible to imagine that its performance will live up to Apple’s vaunted OS experience at the price it’s being sold at–the components simply can’t compete–if it’s to deliver any sort of margin to Copia it’ll have to have cheapish components inside. Interestingly, that’s a route that Sony has majestically decided to avoid. It’s trading on its massive bulk, steady revenues (despite recent glitches) from its wide product base, and has stated that it doesn’t want to “lay claim to the cheapest e-reader.” It’s Reader device won’t take a knock on price because “pricing is one consideration in the dedicate reading device marketplace” and “Sony won’t sacrifice the quality and design we’re bringing book lovers.” It’s an interesting move, and positions Sony’s devices as a high-quality option compared to the burgeoning cheap-end of the e-reader market. This may not be too surprising, though, when you remember that Sony’s products often occupy the higher end of the many markets they operate in. But … it may backfire. Why? Because if the e-reader market gets flooded with cheaper, better competition–like Copia’s machines–Sony may find itself stuck as a minor player.